404 Error Desktop Not Found is a Grunge Wallpaper with unique idea behind. 404 Error shows up when a webpage is not available over the Internet. 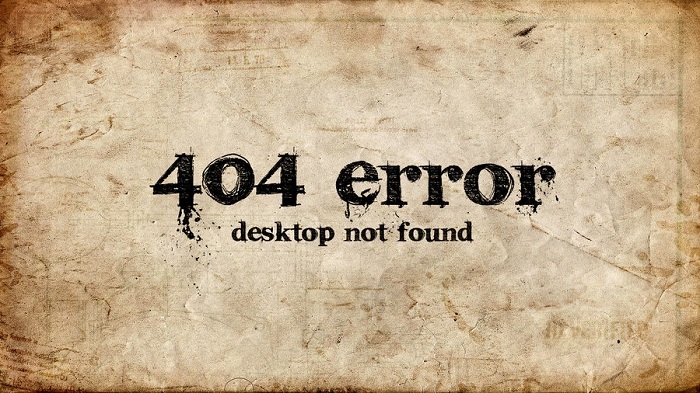 404 Error Desktop Not Found Grunge Wallpaper is created by joerob2468 using Cinema 4d. License : Some rights reserved. This work is licensed under a Creative Commons Attribution-Noncommercial-No Derivative Works 3.0 License. 1920×1080 pixels ; resize if needed. It is a JPG download, the file is very light, only 484 KB in size. This Article Has Been Shared 2392 Times! Shelter is a photo of Calm Landscape and Lonely Nature which is indented to be used as Wallpaper. Steampunk Keyboard – Not only just a Wallpaper, it is really handcrafted and we will show how Steampunk Keyboard is crafted from an ordinary keyboard. Windows 8 Consumer Preview Wallpaper Pack is of collections of Windows 8 Consumer Preview build 8220 Wallpapers. Be of Windows 8 or not, they looks gorgeous. 3D Blue Cubes Wallpaper is an excellent quality digitally rendered 3D wallpaper of an abstract idea partially filled with cubes. Historical Street Wallpaper is fully hand drawn pencil sketch on paper illustrating a city scape scanned to be fit on your desktop. Cite this article as: Abhishek Ghosh, "404 Error Desktop Not Found : Grunge Wallpaper," in The Customize Windows, December 25, 2011, April 25, 2019, https://thecustomizewindows.com/2011/12/404-error-desktop-not-found-grunge-wallpaper/.